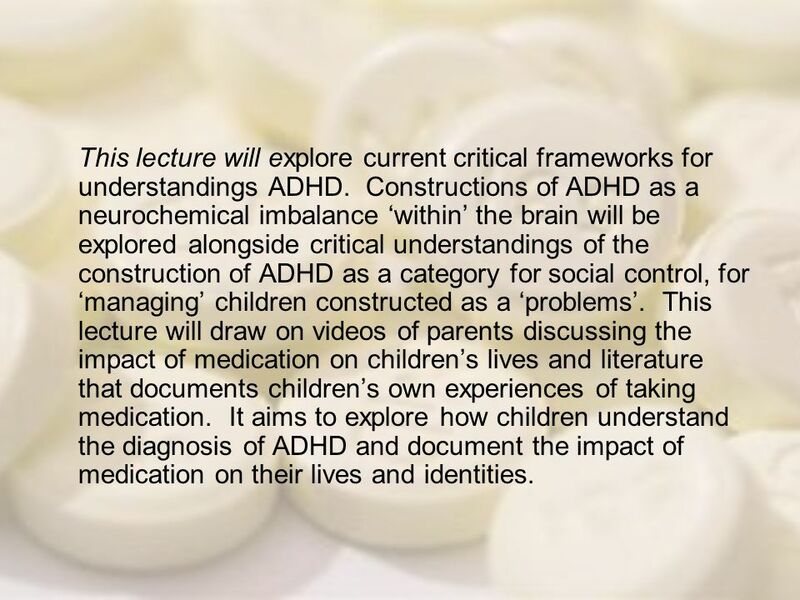 2 This lecture will explore current critical frameworks for understandings ADHD. Constructions of ADHD as a neurochemical imbalance ‘within’ the brain will be explored alongside critical understandings of the construction of ADHD as a category for social control, for ‘managing’ children constructed as a ‘problems’. 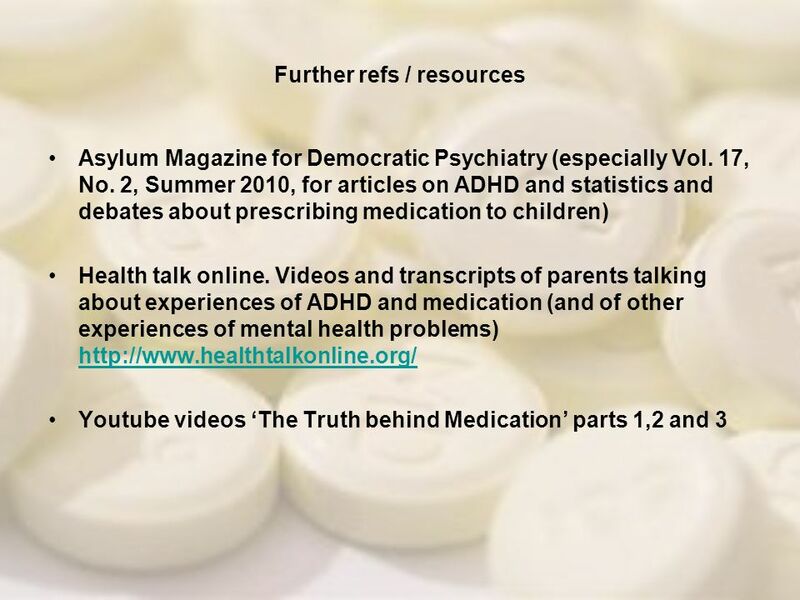 This lecture will draw on videos of parents discussing the impact of medication on children’s lives and literature that documents children’s own experiences of taking medication. 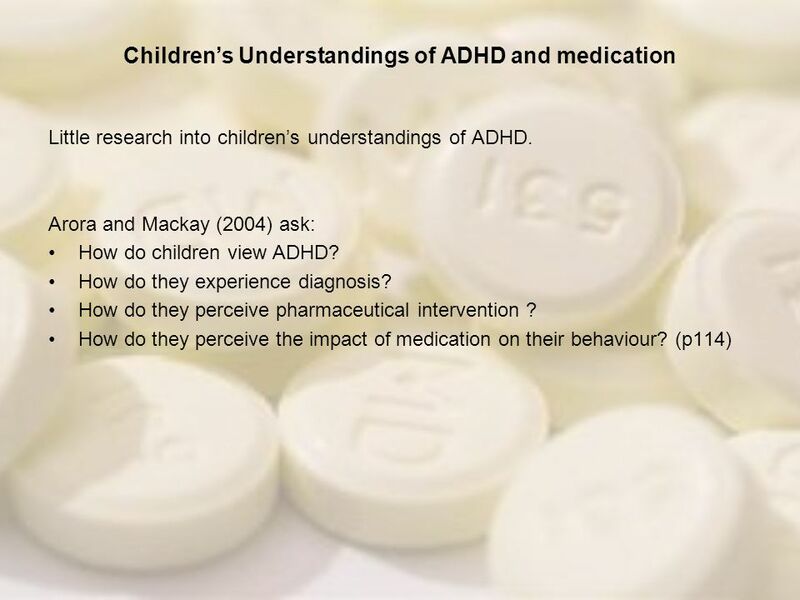 It aims to explore how children understand the diagnosis of ADHD and document the impact of medication on their lives and identities. 5 Six or more of the following symptoms of hyperactivity-impulsivity have persisted for at least 6 months to a degree that is maladaptive and inconsistent with the developmental level: Hyperactivity often fidgets with hands or feet or squirms in seat often leaves seat in classroom or in other situations in which remaining seated is expected often runs about or climbs excessively in situations in which it is inappropriate (in adolescents or adults, may be limited to subjective feelings of restlessness) often has difficulty playing or engaging in leisure activities quietly often talks excessively is often 'on the go' or often acts as if 'driven by a motor' Impulsivity often has difficulty awaiting turn in games or group situations often blurts out answers to questions before they have been completed often interrupts or intrudes on others, e.g. butts into other children's games B. 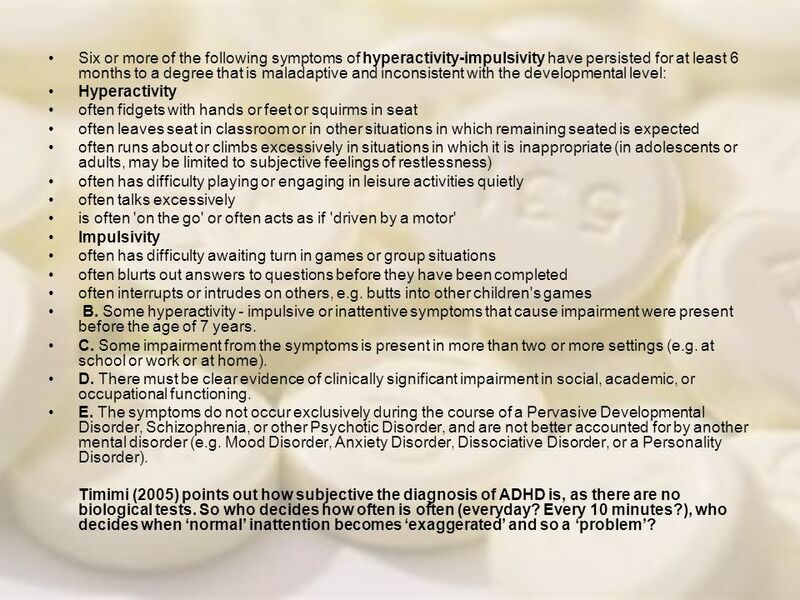 Some hyperactivity - impulsive or inattentive symptoms that cause impairment were present before the age of 7 years. C. Some impairment from the symptoms is present in more than two or more settings (e.g. at school or work or at home). D. There must be clear evidence of clinically significant impairment in social, academic, or occupational functioning. E. The symptoms do not occur exclusively during the course of a Pervasive Developmental Disorder, Schizophrenia, or other Psychotic Disorder, and are not better accounted for by another mental disorder (e.g. Mood Disorder, Anxiety Disorder, Dissociative Disorder, or a Personality Disorder). Timimi (2005) points out how subjective the diagnosis of ADHD is, as there are no biological tests. So who decides how often is often (everyday? Every 10 minutes? ), who decides when ‘normal’ inattention becomes ‘exaggerated’ and so a ‘problem’? 6 History DSM-II (1968) included diagnosis - "Hyperkinetic Reaction of Childhood". DSM-III (1980) "ADD (Attention-Deficit Disorder) with or without hyperactivity“. In 1987 this was changed to ADHD in the DSM-III-R, and in the current edition. 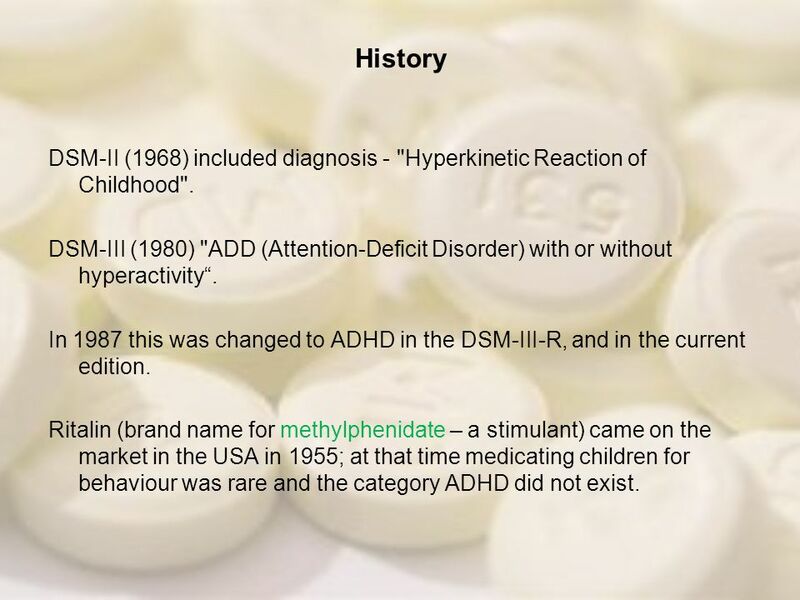 Ritalin (brand name for methylphenidate – a stimulant) came on the market in the USA in 1955; at that time medicating children for behaviour was rare and the category ADHD did not exist. 7 Has ADHD always existed? 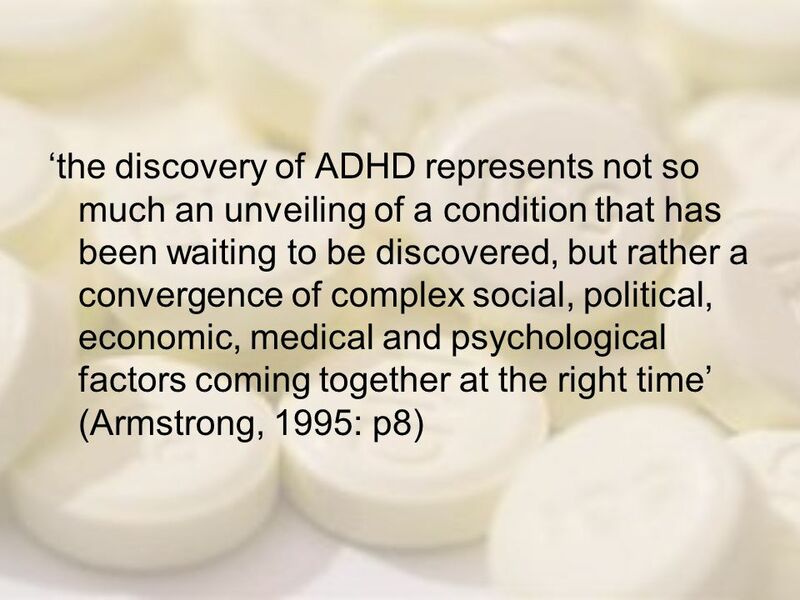 12 Indeed some argue that ADHD has been conceived and promoted by the pharmaceutical industry in order for there to be an entity for which stimulants could be prescribed. It is after all a multimillion dollar industry (Timimi and Radcliffe, 2005:67) In 1993, 3,500 prescriptions were given in the UK for Ritalin; by 2006 the NHS gave out approx 250,000 prescriptions; and in the USA doctors write 2 million prescriptions a month. 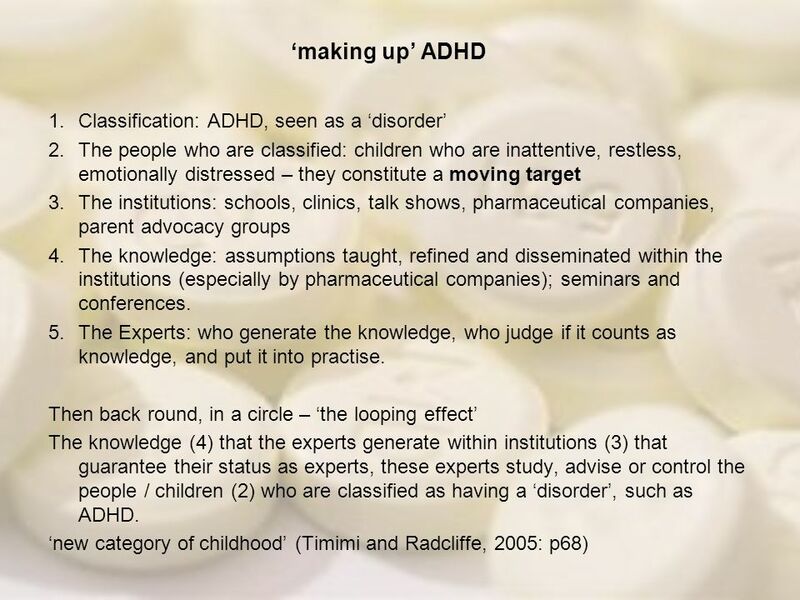 If we bear in mind that the National Institute for Health and Clinical Excellence (NICE) estimates that using the DSM-IV criteria, ADHD is thought to affect 3-9% of school-age children, then we can glimpse the wide impact this medicalisation of childhood could potentially have. 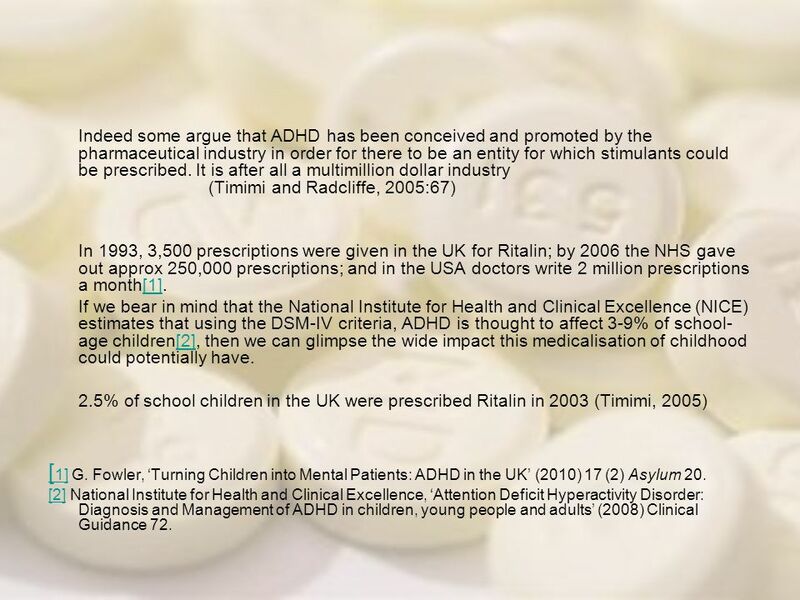 2.5% of school children in the UK were prescribed Ritalin in 2003 (Timimi, 2005)  G. Fowler, ‘Turning Children into Mental Patients: ADHD in the UK’ (2010) 17 (2) Asylum 20. 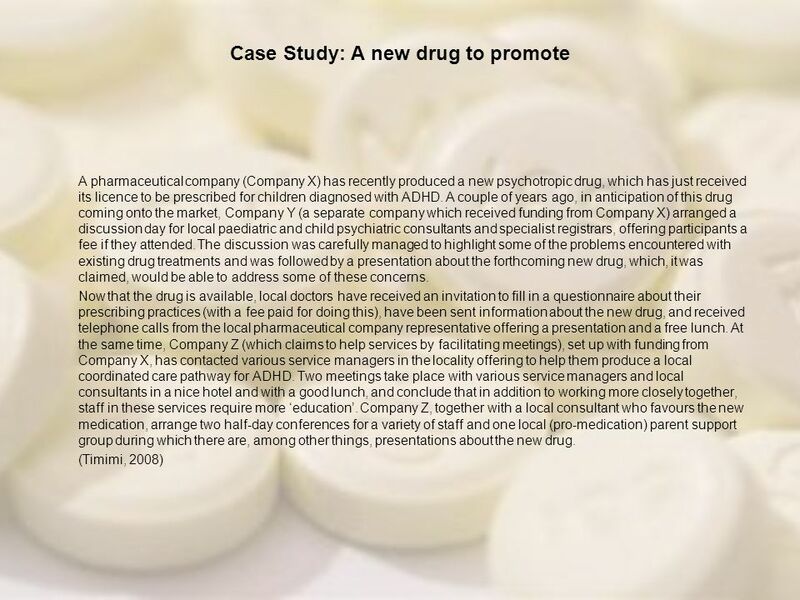 National Institute for Health and Clinical Excellence, ‘Attention Deficit Hyperactivity Disorder: Diagnosis and Management of ADHD in children, young people and adults’ (2008) Clinical Guidance 72. 13 Increases number of people who see themselves / their children in biological terms, and who then present to doctors with ‘ready-made’ diagnoses (Timimi, 2008). Parents often seek medical within-child based explanations for behaviour difficulties (Maras, et al. 2002) However – no conclusive evidence as to genetic differences, brain anomalies, or brain chemical differences (see Timimi, 2005; ). So if there is little evidence why is it perpetuated? 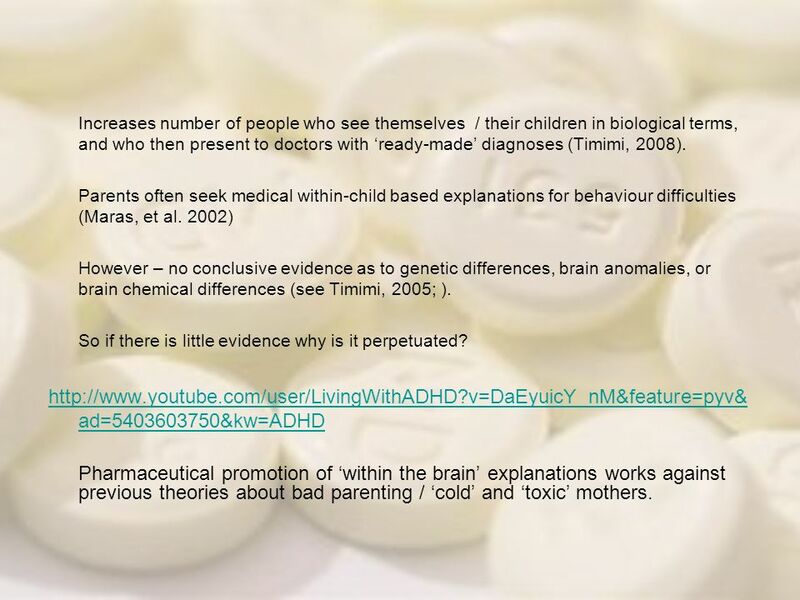 Pharmaceutical promotion of ‘within the brain’ explanations works against previous theories about bad parenting / ‘cold’ and ‘toxic’ mothers. (Mother discussing the effects of Ritalin on her son) So … and he would sit still, he would sit still for hours. He will watch a film from beginning to end and it is just at school really he is hyperactive, but there is so much going on at school and so we went to the clinic and they wanted to put him on Ritalin. Oh I have forgotten all that, yes. 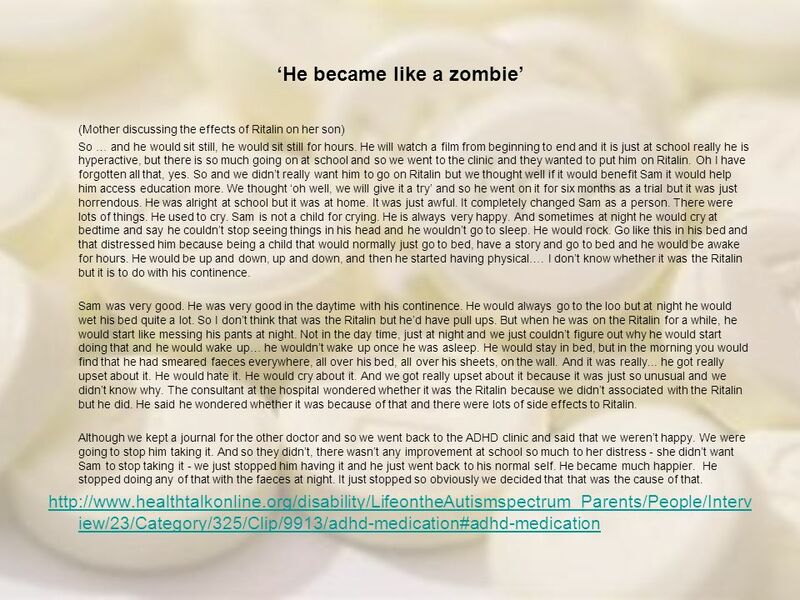 So and we didn’t really want him to go on Ritalin but we thought well if it would benefit Sam it would help him access education more. We thought ‘oh well, we will give it a try’ and so he went on it for six months as a trial but it was just horrendous. He was alright at school but it was at home. It was just awful. It completely changed Sam as a person. There were lots of things. He used to cry. Sam is not a child for crying. He is always very happy. And sometimes at night he would cry at bedtime and say he couldn’t stop seeing things in his head and he wouldn’t go to sleep. He would rock. Go like this in his bed and that distressed him because being a child that would normally just go to bed, have a story and go to bed and he would be awake for hours. He would be up and down, up and down, and then he started having physical…. I don’t know whether it was the Ritalin but it is to do with his continence. Sam was very good. He was very good in the daytime with his continence. He would always go to the loo but at night he would wet his bed quite a lot. So I don’t think that was the Ritalin but he’d have pull ups. But when he was on the Ritalin for a while, he would start like messing his pants at night. Not in the day time, just at night and we just couldn’t figure out why he would start doing that and he would wake up… he wouldn’t wake up once he was asleep. He would stay in bed, but in the morning you would find that he had smeared faeces everywhere, all over his bed, all over his sheets, on the wall. And it was really... he got really upset about it. He would hate it. He would cry about it. And we got really upset about it because it was just so unusual and we didn’t know why. The consultant at the hospital wondered whether it was the Ritalin because we didn’t associated with the Ritalin but he did. 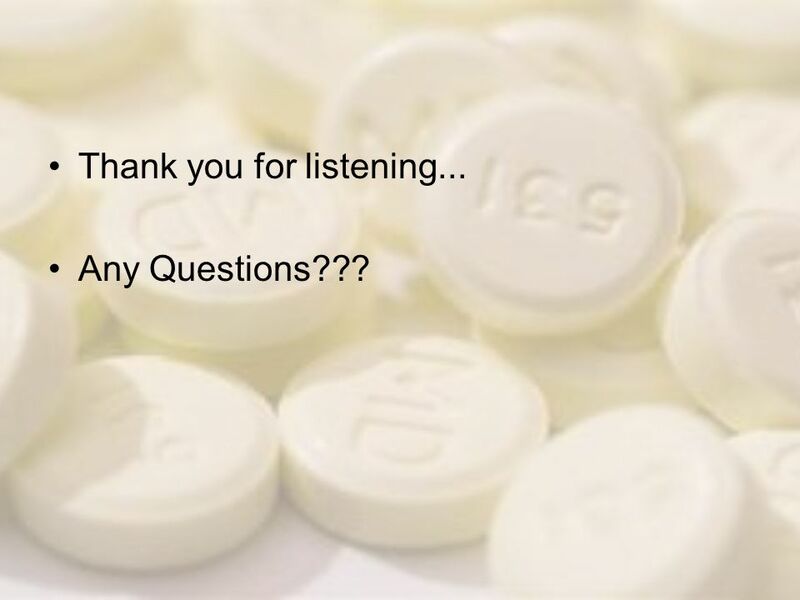 He said he wondered whether it was because of that and there were lots of side effects to Ritalin. Although we kept a journal for the other doctor and so we went back to the ADHD clinic and said that we weren’t happy. We were going to stop him taking it. And so they didn’t, there wasn’t any improvement at school so much to her distress - she didn’t want Sam to stop taking it - we just stopped him having it and he just went back to his normal self. He became much happier. He stopped doing any of that with the faeces at night. It just stopped so obviously we decided that that was the cause of that. 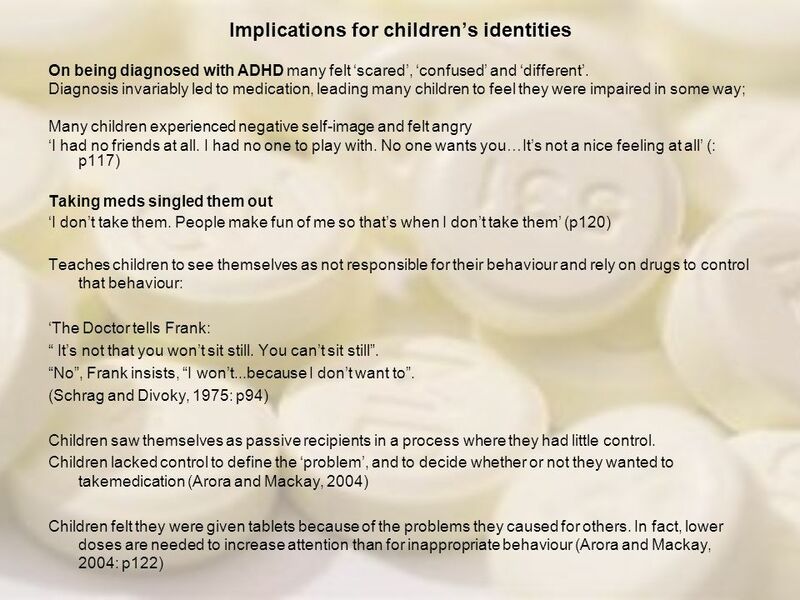 18 Children saw a strong link between their behaviour and medication. 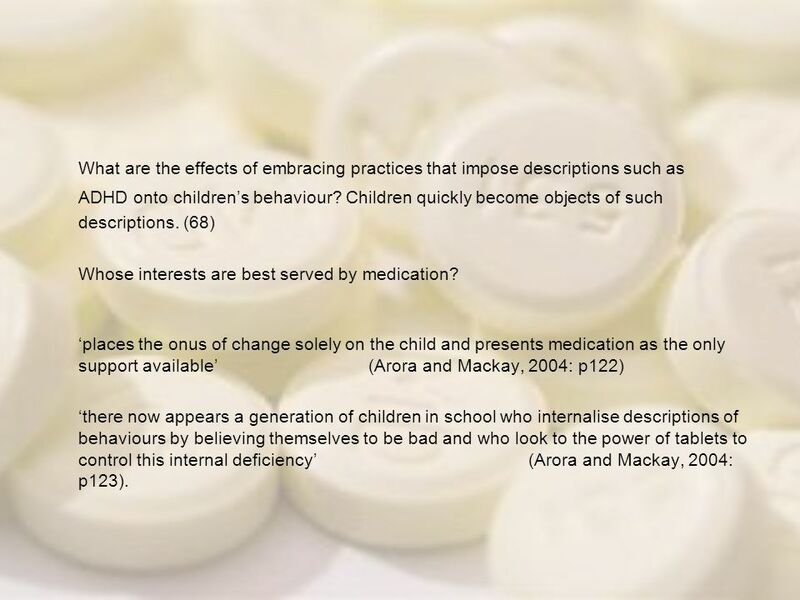 Asked, ‘what if you’re behaviour gets worse?’, one child replied, ‘then he’ll [the doctor] put my tablets up’ (Arora and Mackay, 2004: p118). “I might get better because I get older and then I’ll grow out of it. I might grow out of being bad”. ‘if I do more than six bad things I deserve more than one of my pills’ (p120). 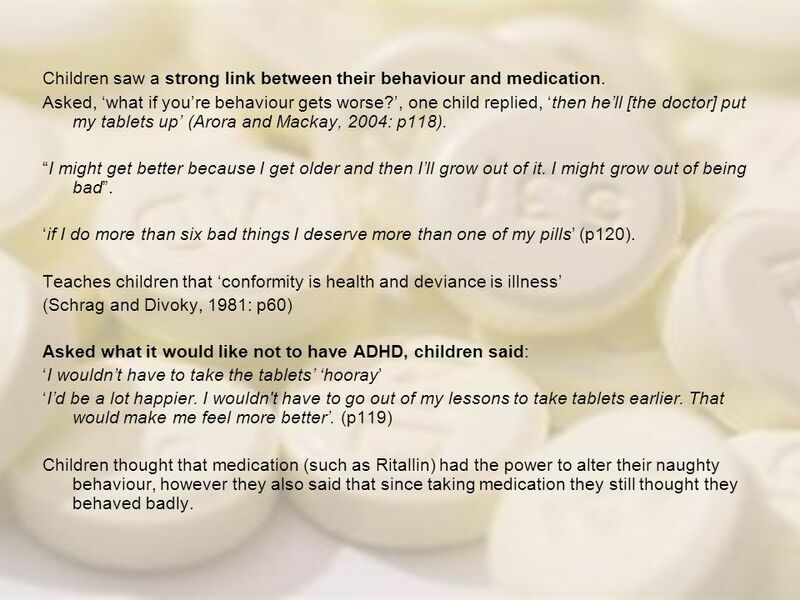 Teaches children that ‘conformity is health and deviance is illness’ (Schrag and Divoky, 1981: p60) Asked what it would like not to have ADHD, children said: ‘I wouldn’t have to take the tablets’ ‘hooray’ ‘I’d be a lot happier. I wouldn't have to go out of my lessons to take tablets earlier. That would make me feel more better’. 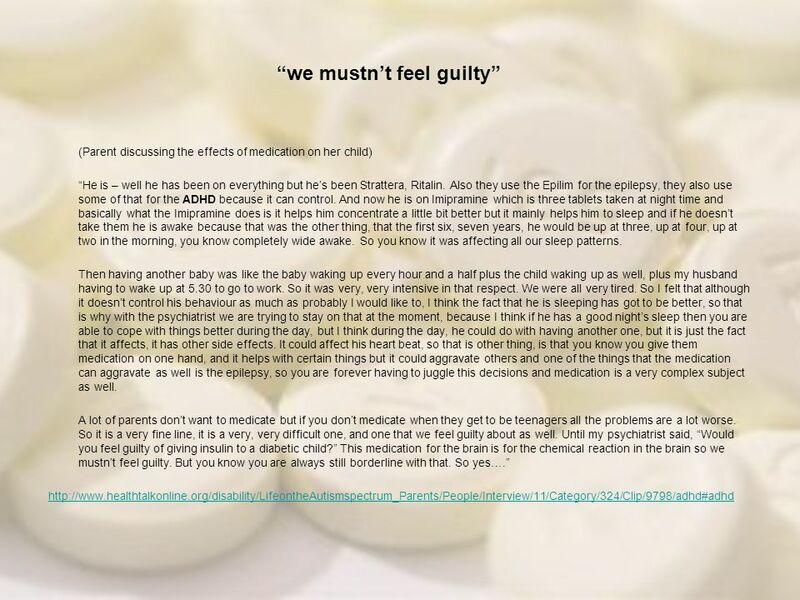 (p119) Children thought that medication (such as Ritallin) had the power to alter their naughty behaviour, however they also said that since taking medication they still thought they behaved badly. ADHD onto children’s behaviour? Children quickly become objects of such descriptions. (68) Whose interests are best served by medication? 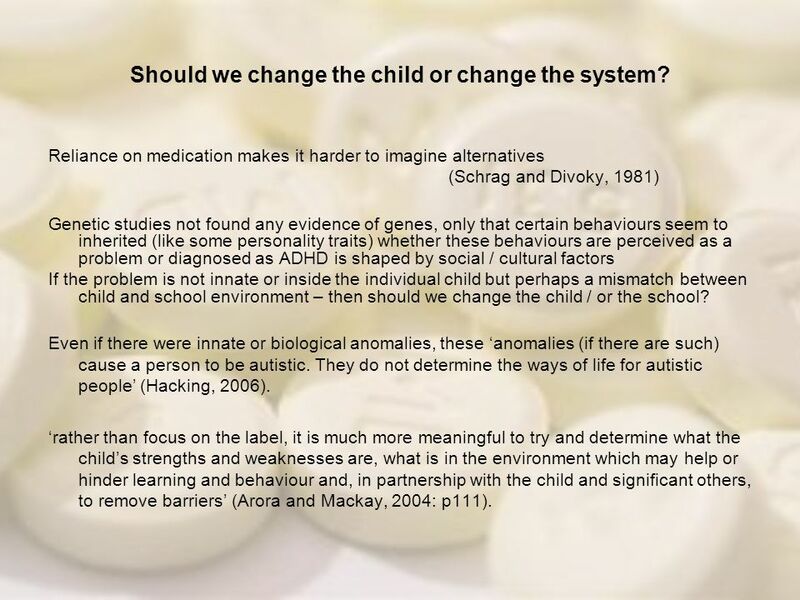 ‘places the onus of change solely on the child and presents medication as the only support available’ (Arora and Mackay, 2004: p122) ‘there now appears a generation of children in school who internalise descriptions of behaviours by believing themselves to be bad and who look to the power of tablets to control this internal deficiency’ (Arora and Mackay, 2004: p123). 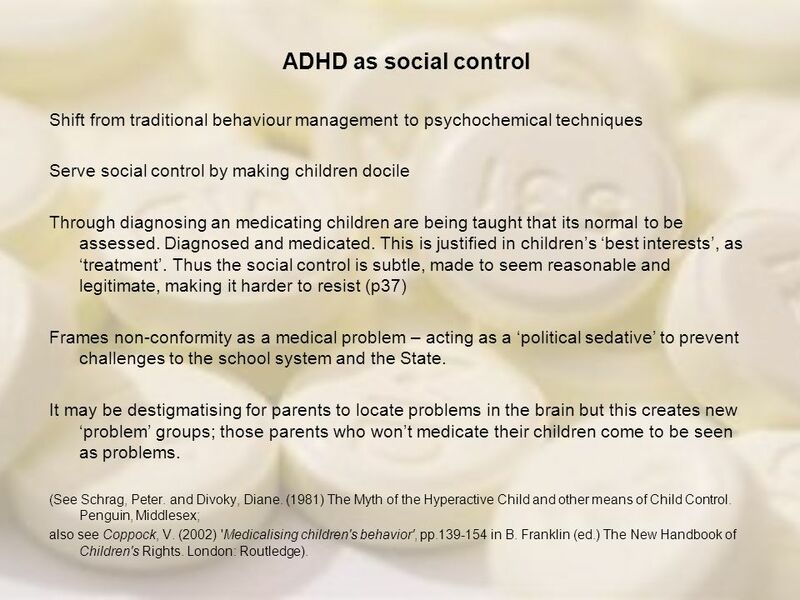 21 ADHD as social control Shift from traditional behaviour management to psychochemical techniques Serve social control by making children docile Through diagnosing an medicating children are being taught that its normal to be assessed. Diagnosed and medicated. This is justified in children’s ‘best interests’, as ‘treatment’. Thus the social control is subtle, made to seem reasonable and legitimate, making it harder to resist (p37) Frames non-conformity as a medical problem – acting as a ‘political sedative’ to prevent challenges to the school system and the State. 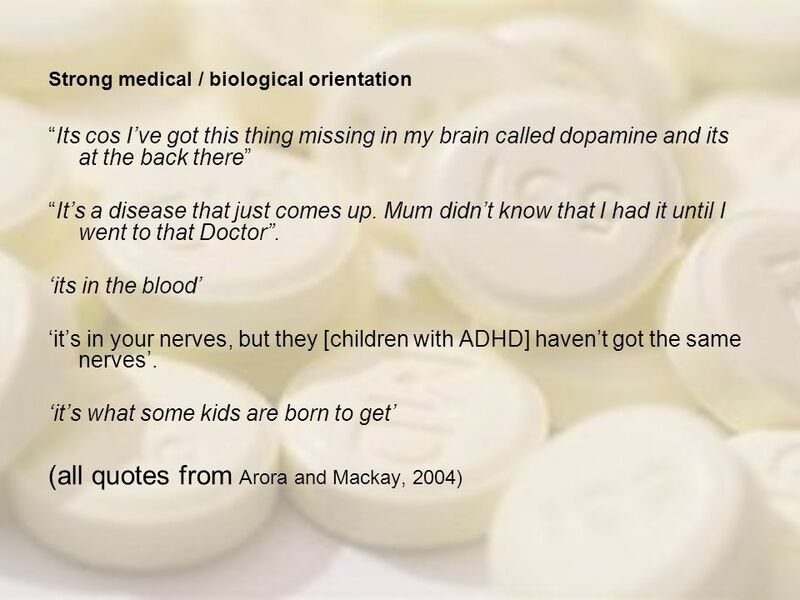 It may be destigmatising for parents to locate problems in the brain but this creates new ‘problem’ groups; those parents who won’t medicate their children come to be seen as problems. (See Schrag, Peter. and Divoky, Diane. (1981) The Myth of the Hyperactive Child and other means of Child Control. Penguin, Middlesex; also see Coppock, V. (2002) 'Medicalising children's behavior', pp in B. Franklin (ed.) The New Handbook of Children's Rights. London: Routledge). To explain the recent rise, to epidemic proportions, of rates of diagnosis of ADHD, a cultural perspective is necessary. The way children’s behaviour is understood and made meaningful is a fact of culture (See Timimi, 2005). 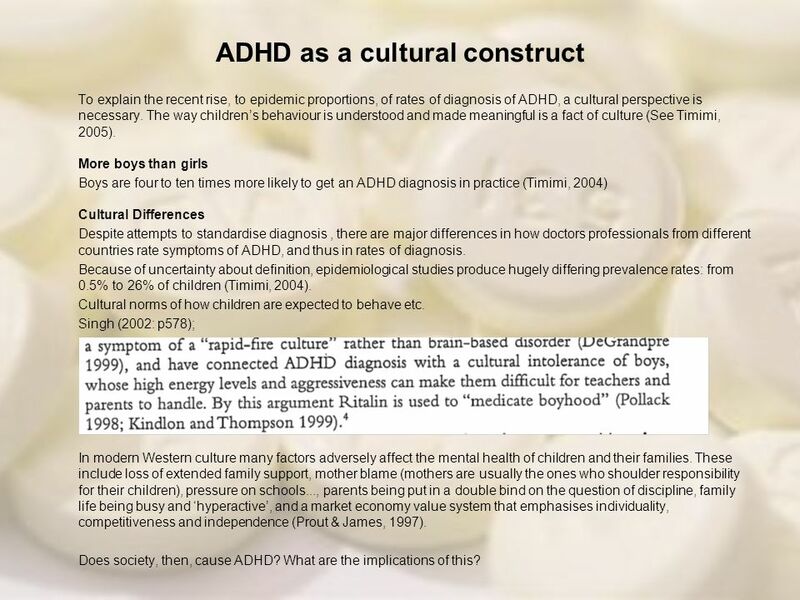 More boys than girls Boys are four to ten times more likely to get an ADHD diagnosis in practice (Timimi, 2004) Cultural Differences Despite attempts to standardise diagnosis , there are major differences in how doctors professionals from different countries rate symptoms of ADHD, and thus in rates of diagnosis. Because of uncertainty about definition, epidemiological studies produce hugely differing prevalence rates: from 0.5% to 26% of children (Timimi, 2004). Cultural norms of how children are expected to behave etc. Singh (2002: p578); In modern Western culture many factors adversely affect the mental health of children and their families. These include loss of extended family support, mother blame (mothers are usually the ones who shoulder responsibility for their children), pressure on schools..., parents being put in a double bind on the question of discipline, family life being busy and ‘hyperactive’, and a market economy value system that emphasises individuality, competitiveness and independence (Prout & James, 1997). 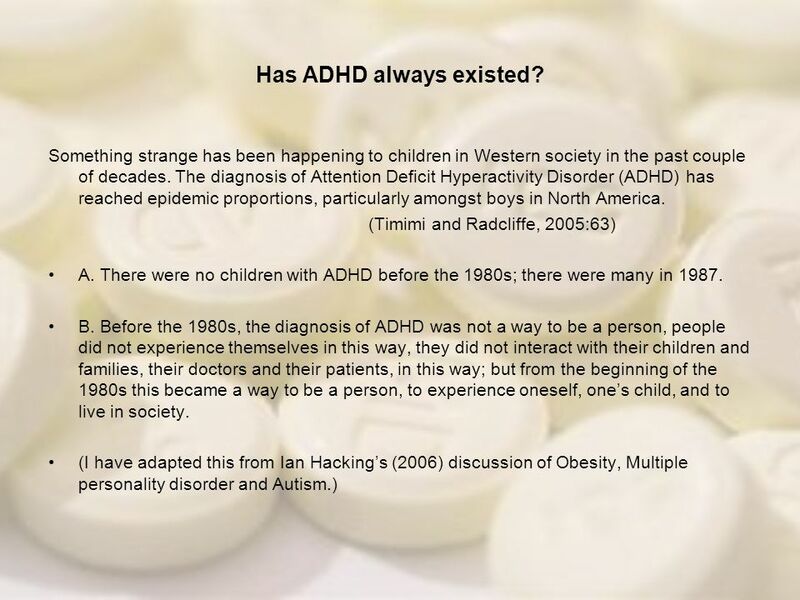 Does society, then, cause ADHD? What are the implications of this? 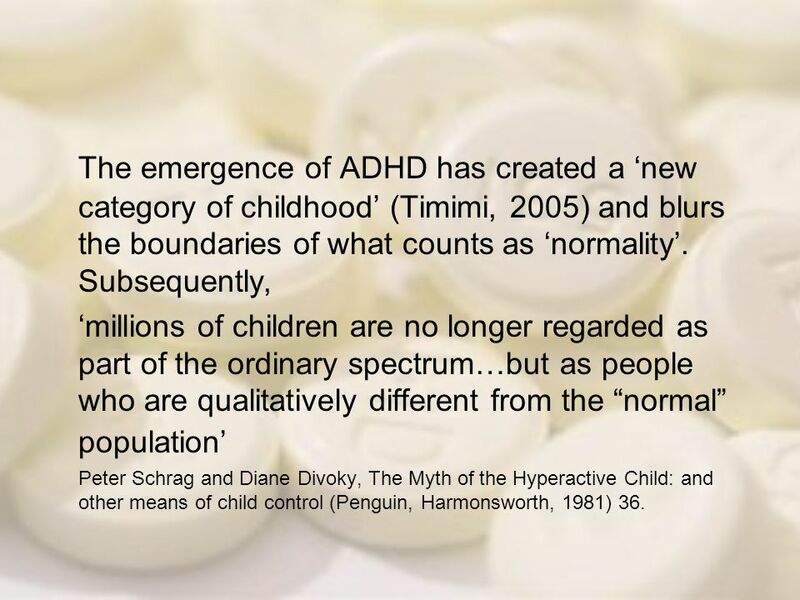 24 The emergence of ADHD has created a ‘new category of childhood’ (Timimi, 2005) and blurs the boundaries of what counts as ‘normality’. Subsequently, ‘millions of children are no longer regarded as part of the ordinary spectrum…but as people who are qualitatively different from the “normal” population’ Peter Schrag and Diane Divoky, The Myth of the Hyperactive Child: and other means of child control (Penguin, Harmonsworth, 1981) 36. 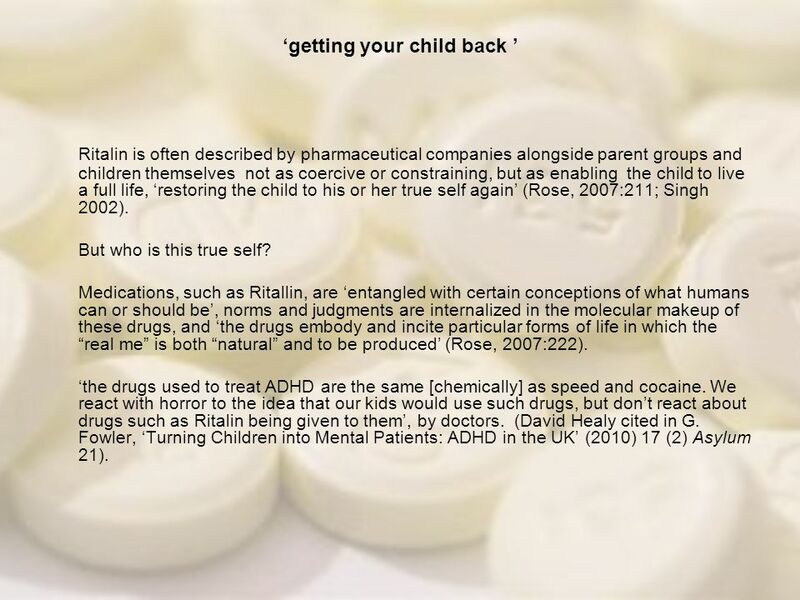 Ritalin is often described by pharmaceutical companies alongside parent groups and children themselves not as coercive or constraining, but as enabling the child to live a full life, ‘restoring the child to his or her true self again’ (Rose, 2007:211; Singh 2002). But who is this true self? 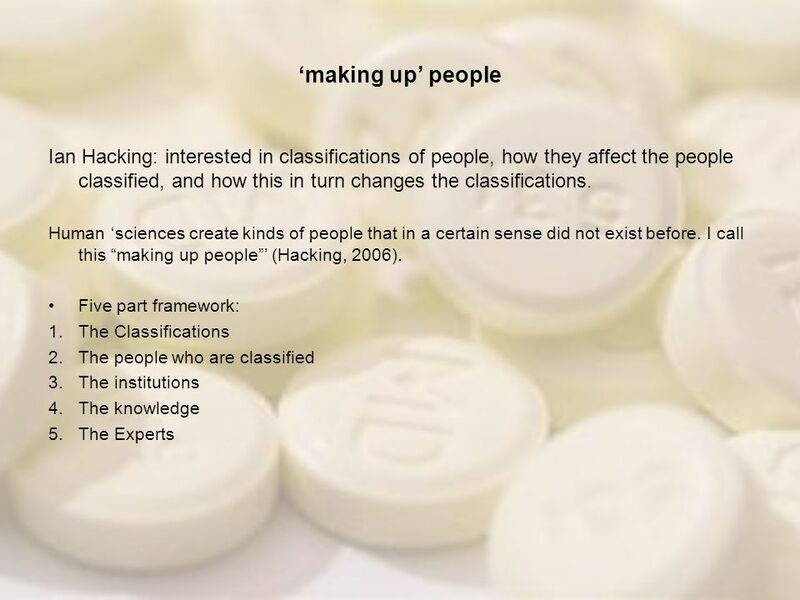 Medications, such as Ritallin, are ‘entangled with certain conceptions of what humans can or should be’, norms and judgments are internalized in the molecular makeup of these drugs, and ‘the drugs embody and incite particular forms of life in which the “real me” is both “natural” and to be produced’ (Rose, 2007:222). 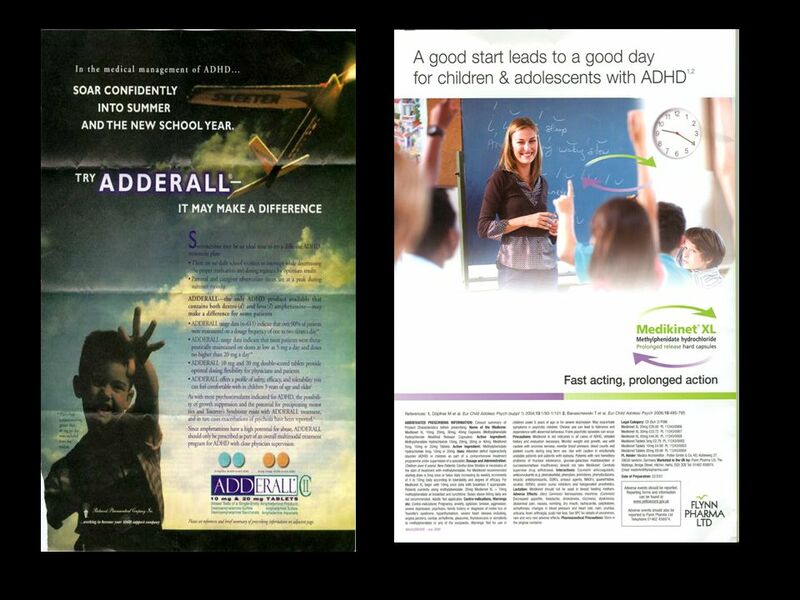 ‘the drugs used to treat ADHD are the same [chemically] as speed and cocaine. We react with horror to the idea that our kids would use such drugs, but don’t react about drugs such as Ritalin being given to them’, by doctors. 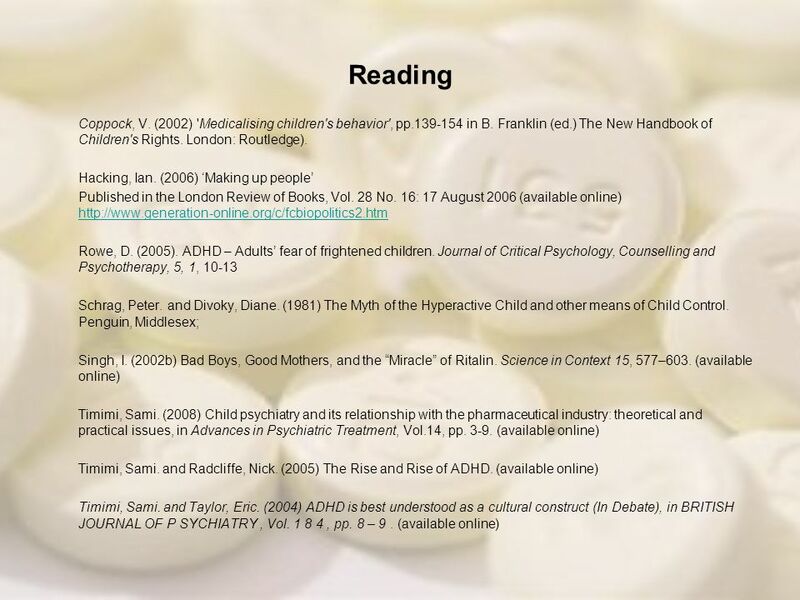 (David Healy cited in G. Fowler, ‘Turning Children into Mental Patients: ADHD in the UK’ (2010) 17 (2) Asylum 21). 26 Should we change the child or change the system? Reliance on medication makes it harder to imagine alternatives (Schrag and Divoky, 1981) Genetic studies not found any evidence of genes, only that certain behaviours seem to inherited (like some personality traits) whether these behaviours are perceived as a problem or diagnosed as ADHD is shaped by social / cultural factors If the problem is not innate or inside the individual child but perhaps a mismatch between child and school environment – then should we change the child / or the school? Even if there were innate or biological anomalies, these ‘anomalies (if there are such) cause a person to be autistic. They do not determine the ways of life for autistic people’ (Hacking, 2006). ‘rather than focus on the label, it is much more meaningful to try and determine what the child’s strengths and weaknesses are, what is in the environment which may help or hinder learning and behaviour and, in partnership with the child and significant others, to remove barriers’ (Arora and Mackay, 2004: p111). 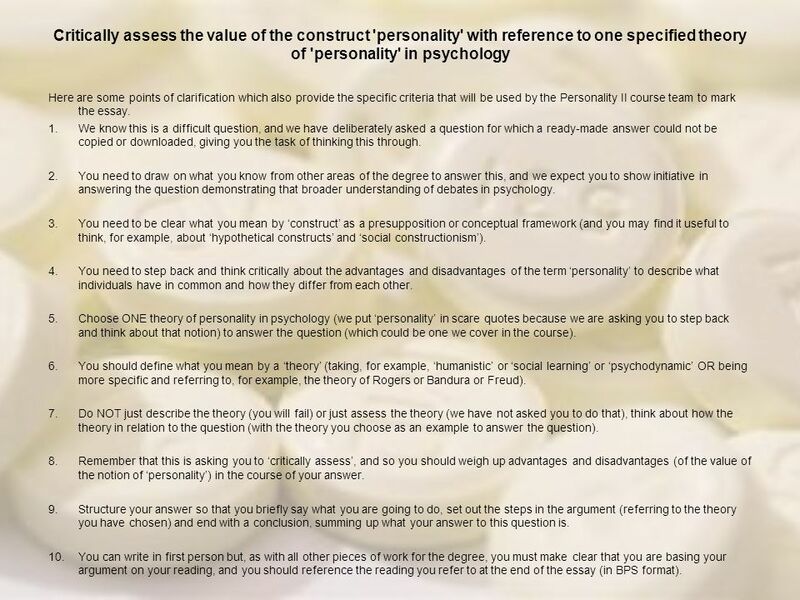 31 Critically assess the value of the construct 'personality' with reference to one specified theory of 'personality' in psychology Here are some points of clarification which also provide the specific criteria that will be used by the Personality II course team to mark the essay. 1. We know this is a difficult question, and we have deliberately asked a question for which a ready-made answer could not be copied or downloaded, giving you the task of thinking this through. 2. You need to draw on what you know from other areas of the degree to answer this, and we expect you to show initiative in answering the question demonstrating that broader understanding of debates in psychology. 3. You need to be clear what you mean by ‘construct’ as a presupposition or conceptual framework (and you may find it useful to think, for example, about ‘hypothetical constructs’ and ‘social constructionism’). 4. You need to step back and think critically about the advantages and disadvantages of the term ‘personality’ to describe what individuals have in common and how they differ from each other. 5. Choose ONE theory of personality in psychology (we put ‘personality’ in scare quotes because we are asking you to step back and think about that notion) to answer the question (which could be one we cover in the course). 6. 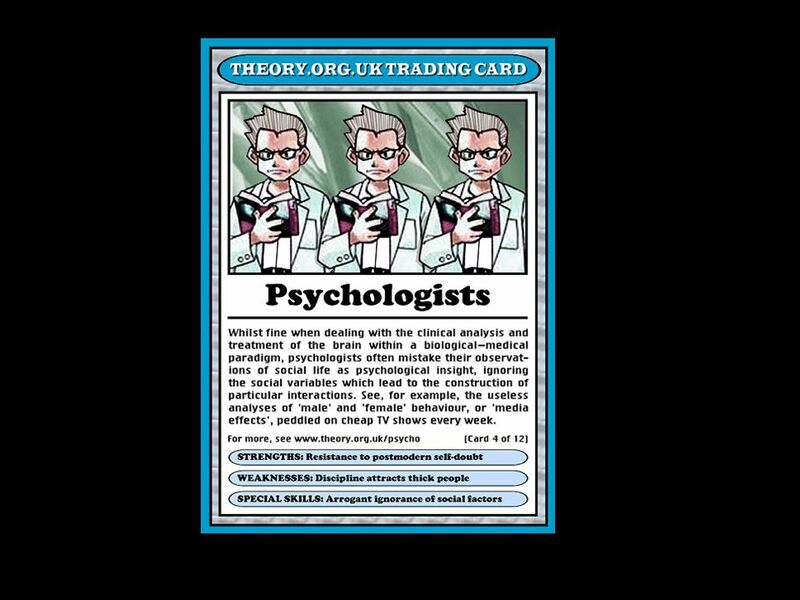 You should define what you mean by a ‘theory’ (taking, for example, ‘humanistic’ or ‘social learning’ or ‘psychodynamic’ OR being more specific and referring to, for example, the theory of Rogers or Bandura or Freud). 7. Do NOT just describe the theory (you will fail) or just assess the theory (we have not asked you to do that), think about how the theory in relation to the question (with the theory you choose as an example to answer the question). 8. Remember that this is asking you to ‘critically assess’, and so you should weigh up advantages and disadvantages (of the value of the notion of ‘personality’) in the course of your answer. 9. Structure your answer so that you briefly say what you are going to do, set out the steps in the argument (referring to the theory you have chosen) and end with a conclusion, summing up what your answer to this question is. 10. You can write in first person but, as with all other pieces of work for the degree, you must make clear that you are basing your argument on your reading, and you should reference the reading you refer to at the end of the essay (in BPS format). 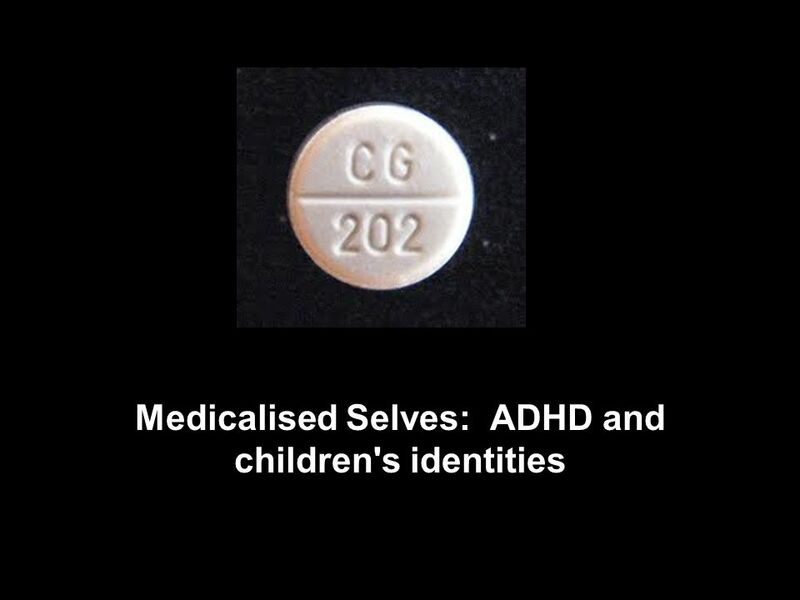 Download ppt "Medicalised Selves: ADHD and children's identities"
ADHDADHD (Attention Deficit Disorder) with or without hyperactivity. ADD Update Kristi Maroni, MD Lance Feldman, MD, MBA, BSN. Sources: NIMH Mental Health: A Report of the Surgeon General Copyright © Notice: The materials are copyrighted © and trademarked ™ as the property of The. Understanding Students With Attention-Deficit/Hyperactivity Disorder. All That Wiggles Is Not ADHD History, Assessment, and Diagnosis of ADHD Jodi A. Polaha, Ph.D. Assistant Professor, Pediatrics Munroe-Meyer Institute, UNMC. Carolyn R. Fallahi, Ph. D. Attention Deficit Hyperactivity Disorder. Attention-Deficit/ Hyper Activity Disorder ( ADHD) By: Bianca Jimenez Period:5. ADHD & ADD Understanding the Criteria for Attention Deficit Hyperactivity Disorder Adapted from American Psychiatric Association. (1994). Diagnostic and. ADHD, Executive Functions and PKU Kevin M. Antshel, Ph.D. Associate Professor of Psychiatry / Licensed Psychologist State University of New York – Upstate. ADHD By Elizabeth Mihalick. 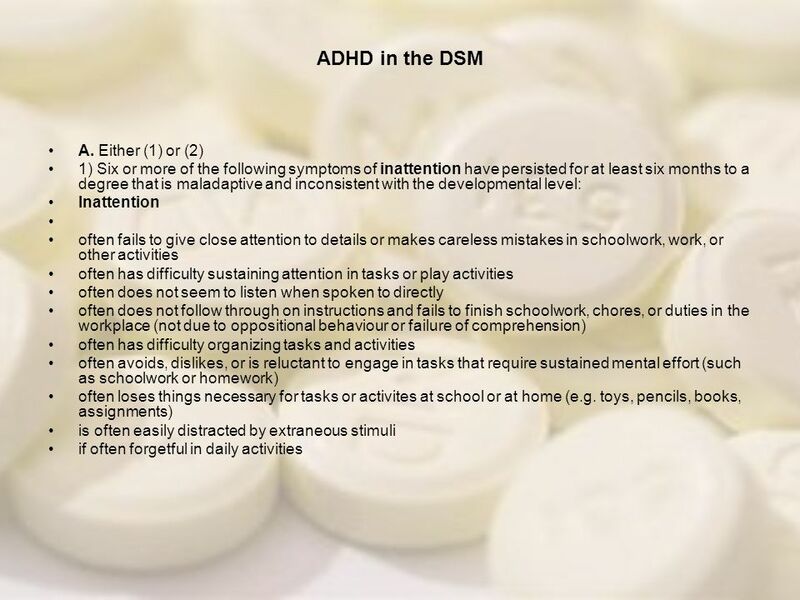 What is ADHD?  Attention deficit hyperactivity disorder (ADHD) is one of the most common childhood disorders and can continue. AD/HD General Medical Information Mary Margaret Dagen, M.D. Mary Margaret Dagen, M.D. Westshore Family Medicine Westshore Family Medicine April 24, 2013. ADHD and initiation of drinking and drinking to intoxication in girls: Is there an association? Valerie S. Knopik, Pamela A.F. Madden, and Andrew C. Heath. Helping inattentive, hyperactive and impulsive children Christine Merrell. Attention Deficit Disorder Melissa Homakie, Sarah Keenan Haley Martin, Kristina Morris. Students with Attention Deficit Disorders. Students with ADHD may be serviced under IDEA Under “other health impairment” having limited strength, vitality. 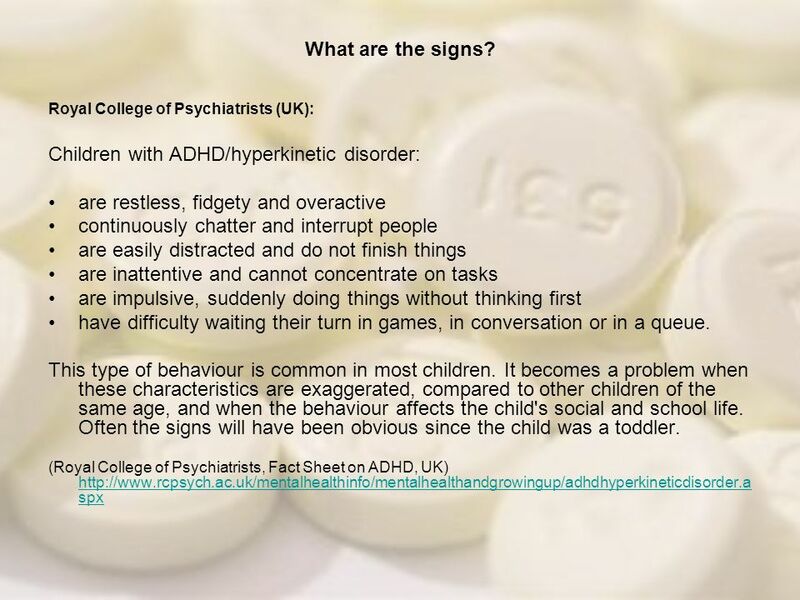 ADHD and ADD Attention Deficit Hyperactive Disorder and Attention Deficit Disorder. Attention-Deficit/Hyperactivity Disorder: Symptoms of ADHD The symptoms of ADHD include inattention and/or hyperactivity and impulsivity. These are traits. Adult ADHD: The Problems, the Tests, the Treatments, the Challenges Quintin T. Chipley, M.A., M.D.